There are innumerable moments in our life that we wish to capture. But it is difficult to capture them all, due to various factors. 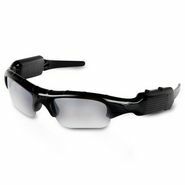 This stylish sunglasses can record video allowing you to capture all those precious moments without any trouble. You just have to wear it and its amazing functions like inbuilt camera will make your wishes come true. It is fun to have this incredible thing especially when you're on an adventurous trip.